Perfect Male Card with Perfect Pennants from Stampin' Up! I have so many male birthday's at the moment it was a great excuse to use Perfect Pennants from Stampin' Up! 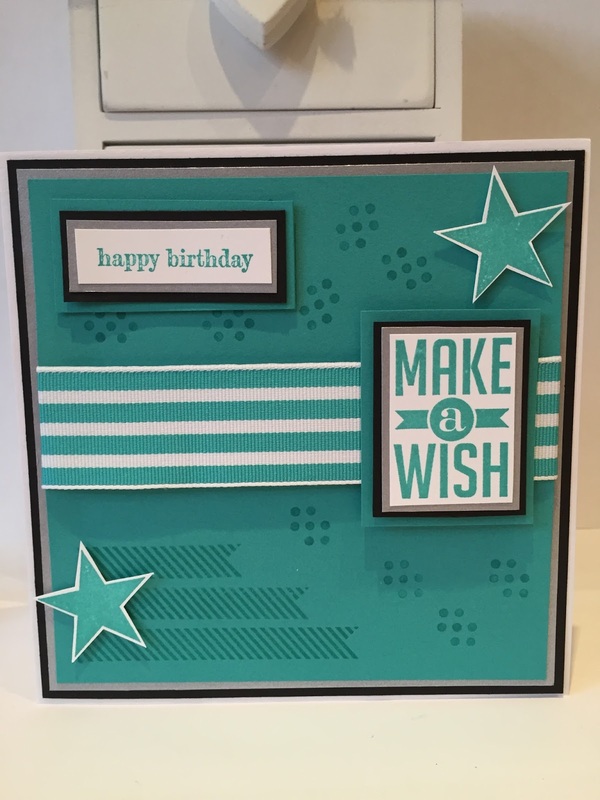 It's one of my favourite stamp sets for a male birthday card as it has the lovely "Make a Wish" sentiment in it which I love and to me it's such a lovely thing to do on a birthday! As it was a male card I went for dark strong colours, Basic Black and Bermuda Bay fitted the bill perfectly so I decided to use them. The great thing about Stampin' Up! is that everything co-ordinates so beautifully and that includes there ribbons so to add that little something extra and to finish it off I used Stripped Grosgrain Ribbon in Bermuda Bay. I'm very happy with the finished card and I'm sure the young man it's going to is going to love it to. I have listed all the supplies used below if you would like to make this card. 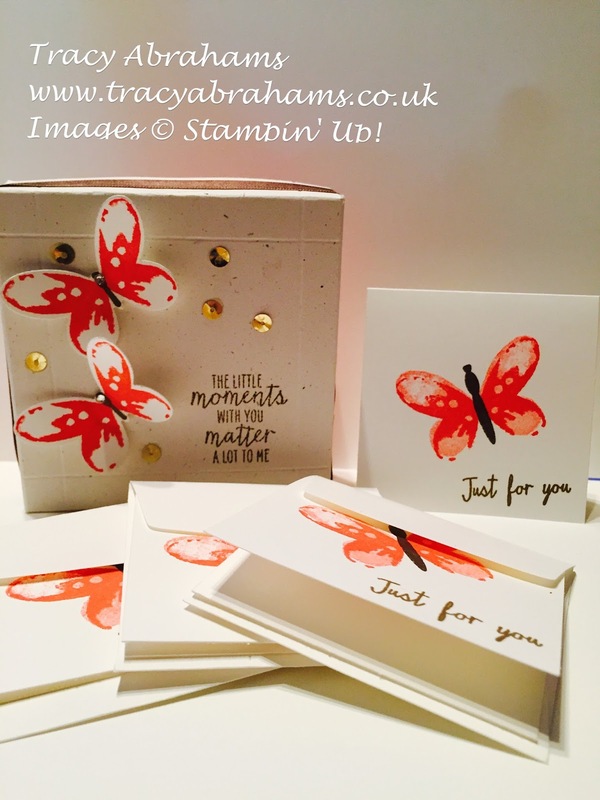 Please don't forget to use my monthly Hostess code of JSPDPQBV if you make a purchase of over £20 as I send out a FREE thank you gift and card at the end of the month. Please also remember to tick the contact button so I have your address to send the gift to. I will only contact you again if you would like updates to special offers. 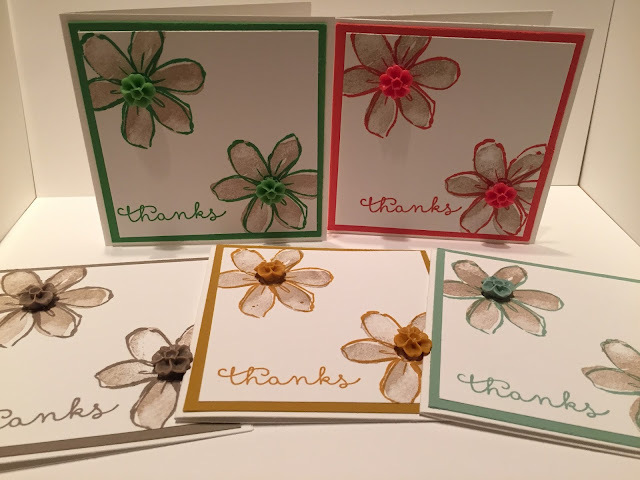 I have quite a few birthdays coming up so I decided to use Celebrate Today by Stampin' Up! and get started. I love the colour combination of Smoky Slate and Pink Pirouette so pretty. 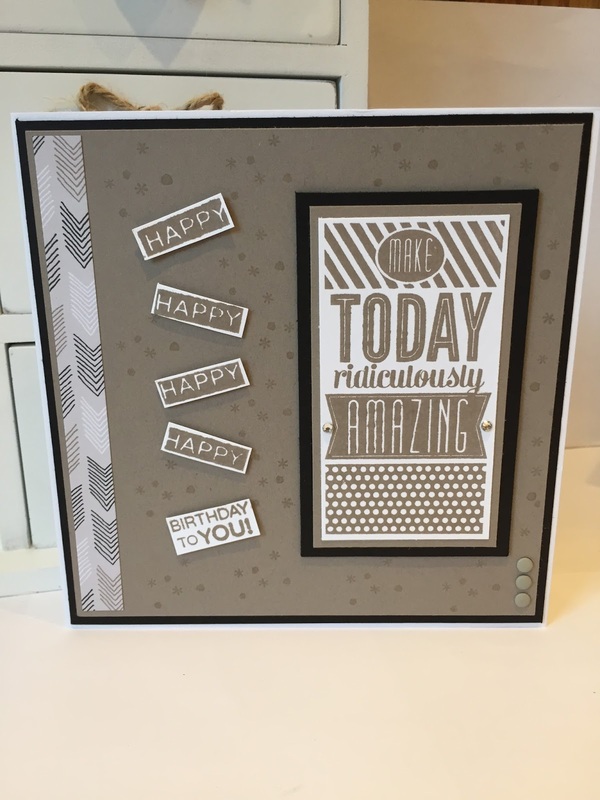 I used the Pink Pirouette as the base and the Smoky Slate as the top layer for the card. 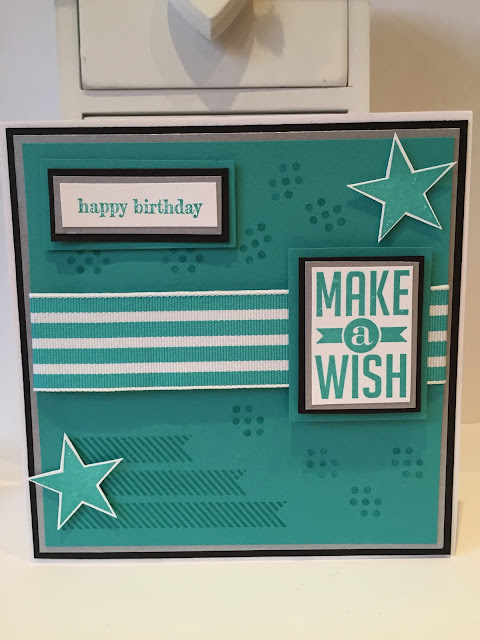 I embossed the Smoky Slate card stock with the lovely Lucky Stars Embossing Folder on my big shot, which gives a lovely effect. I then stamped the Happy balloon sentiment from the stamp set on to the Pink Pirouette using VersaMark and Silver Emboss Powder and set it with my heat tool. I also embossed the birthday sentiment on to Whisper White card stock with silver embossing powder and cut that out with the Word Window Punch. 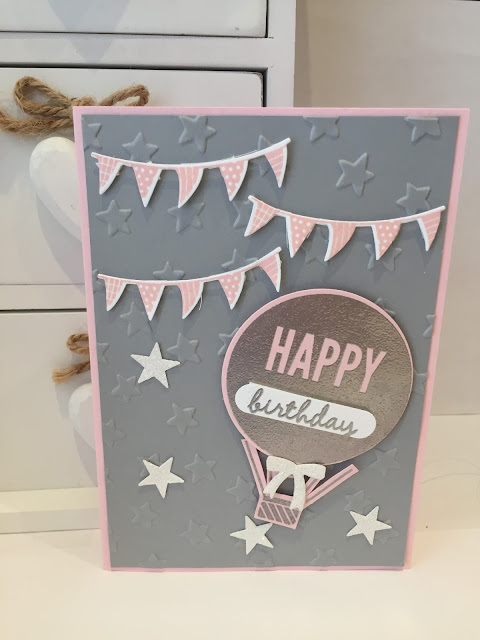 I cut the balloon and the flags I stamped with Pink Pirouette, out with the matching Balloon Framelits which co-ordinates perfectly with the Celebrate Today Stamp Set. The basket was embossed with the Silver Embossing powder and cut out by hand. I cut out the ribbon element under the balloon using the framelits in Dazzling Diamond Glimmer Paper. Lastly I cut out some little stars with the Itty Bitty Accents Punch Pack in Dazzling Diamond Glimmer Paper and popped it all together. I hope you like it.